The Black Keys and Florence and the Machine will also top the three-day Chicago musical festival lineup. 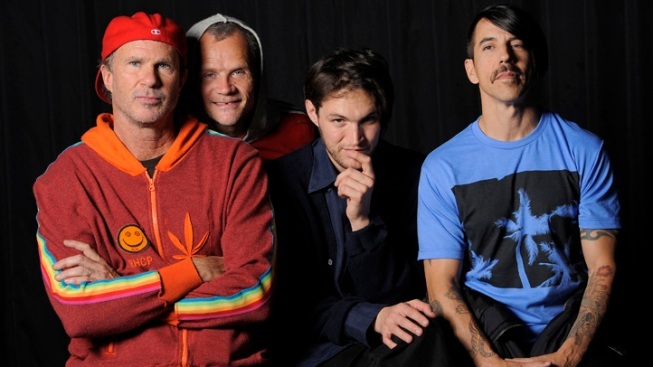 Members of the Red Hot Chili Peppers, from left, drummer Chad Smith, bassist Flea, guitarist Josh Klinghoffer and singer Anthony Kiedis pose for a portrait in the Hollywood in mid-March. The Red Hot Chili Peppers, The Black Keys and English indie darlings Florence and the Machine will headline this year's three-day Lollapalooza music festival in Chicago, Jane's Addiction lead singer and Lollapalooza founder Perry Farrell announced Wednesday. "Every year it's kind of a nail biter putting a lineup together," Farrell said in an interview. "There were moments when I looked at it and I was beside myself. I didn't know what to do." But with the final list also including acts such as Black Sabbath, Jack White and Sigur Ros, "that lineup is just going to be so exciting and it's so diverse. I think it works so well," Farrell said. The festival in Chicago's sprawling Grant Park begins Aug. 3. The schedule of more than 120 bands features Lollapalooza's signature mix of mainstream headliners and indie bands. The global factor is strong with acts from across Europe, Chile, Australia and Malaysia. It also reflects American music hubs like Austin, Nashville and Portland, spanning genres from rock to pop, hip hop and rap to electronic dance. Bloc Party, Franz Ferdinand, The Afghan Whigs, The Shins and former "American Idol" contestant Haley Reinhart are on the bill. The full lineup is available on Lollapalooza's website. In recent years headliners have included Lady Gaga, Green Day, Eminem and Coldplay. Putting together the perfect lineup has a special set of challenges, Farrell said. "You are trying to balance a lot of things," he said. "Balance economics, there's budget how much we can afford for talent. You're trying to balance that with who's available." Farrell said he sees his role as curatorial, "purely as a music selector." This year he sees a special place for electronic dance music, with acts Justice and Avicii headlining the main stage. "To me that's honoring dance music," Farrell said. Lollapalooza competes for music fans' festival dollars with other events throughout the summer and early fall. This year's Lollapalooza lineup goes up against Radiohead, Phish and The Beach Boys at the Bonnaroo Music and Arts Festival from June 7- 10 in Manchester, Tenn. The Red Hot Chili Peppers also are playing Bonnaroo this year. This month's Coachella Valley Music and Arts Festival in Indio, Calif., features Radiohead, Feist and Dr. Dre and Snoop Dogg. The Austin City Limits Music Festival hasn't released its October lineup. This is Lollapalooza's eighth year in Chicago. Last year's festival sold out at 90,000 visitors a day, or 270,000 over the three-day event. Discounted souvenir and early bird three-day passes priced at $75 and $200 have sold out. Regular priced $230 passes are available.